It was nice to talk and meet with the folks at Cummings Park Community Flat who are taking part in our community project. There are over 20 people in the area growing potatoes at home and in the Flat gardens, and we are looking forward to seeing how you all get on! 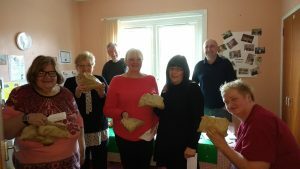 Support from Aberdeen Soup – Thanks!